To begin the process of forage identification, the following common species are described and illustrated. Any learner wanting to develop identification skills must gradually build a mental key to the various species characteristics. 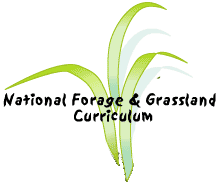 The examples that follow will build a foundation for learning to identify other forages and help the learner discover what they need to do to learn identification skills. Most learners need gradual, but consistent accumulation accompanied with lots of practice. Use this objective with the next objective to practice the identification process. perennial ryegrass (Lolium perenne L.) also called English ryegrass. inflorescence-spikelike with sessile (attached to main stem) spikelets that are flat, without awns, alternating edgewise up the stem. culm-stems grow erect, bunch formation. leaf-the blade is hairless, flat, broad, and tapered to tip. The upper surface is ridged, but the bottom is very shiny with a prominent midrib. collar-short, unfringed membranous, truncated (cut off horizontally) ligule with slender, clawlike auricles. Leaves in bud are folded. tiller-usually has no more than 3 leaves at one time. roots-highly branched, adventitious roots from basal nodes of tiller. seed-awnless lemma, tan and smaller than annual ryegrass seed. annual ryegrass (Lolium mutiflorum Lam.) also called Italian ryegrass. inflorescence-spikelike with sessile spikelets that are flat, awned, alternating edgewise up the stem. culm-yellowish-green at base with hollow internodes. leaf-rolled leaves in bud, slender, shiny, flat, taper to the tip, with a conspicuous midrib. collar-membranous, glabrous (hairless), truncated ligule with narrow, glabrous, long, clawlike auricles. roots-highly branched and dense, highly adventitious. seed-tan, lemma is awned, and larger than annual ryegrass seed. Many ryegrass plants are hybrids and the distinctions between perennial and annual are difficult. Annual ryegrass has awns on the inflorescences that remain on the seeds and has rolled leaves in the leaf bud. If these distinctions cannot be made, the plant is probably a hybrid. Ryegrasses have the distinct zig-zag spikelets attached edgewise to the stem. orchardgrass (Dactylis glomerata L.) also called Cocksfoot. inflorescence-stiff panicle compact or slightly spreading, lower branches of inflorescence are longer than top ones, no awns. culm-hollow, 3.3-4.3 feet (1-1.3 meters) high with 2-4 nodes. leaf-folded in bud, sheath is distinctively flattened and keeled, light green to dark bluegreen with rough edges. collar-divided, glabrous with membranous ligule and no auricles. tiller-continuously produced, many remain vegetative producing many leaves. Orchardgrass is easy to identify by its flattened leaf sheath, and the inflorescence can be recognized at a distance by the way the panicle leans to look as if the spikelet grows on only one side. inflorescence-4-12 inches (10.2-30.5 centimeters) contracted panicle. culm-erect, stout, smooth, old sheaths exist. leaf-many, ribbed, dark green; upper side is rough and ribbed, lower side is smooth shiny. collar-ciliated (hairy) auricles, short (2mm), finely serrated ligule. tiller-large tillers and may have short rhizomes. seed-large, long, light brown, straw color. inflorescence-open panicle, often one-sided, spreading. leaf-flat, tapers to tip, smooth on top, distinct "W" at midpoint of leaf, dull on lower side, soft, limp. collar-membranous truncated, rounded, small ligule, no auricle, sheath is closed and may have small hairs. inflorescence-panicle, open and pyramid shaped. culm-low-growing, herbaceous with hollow internodes. leaf-smooth, conspicuous midrib, terminal boat-shaped tip, lower side is dull, sheath is compresssed, usually split, glabrous (hairless), green. Translucent grooves appear on each side of leaf midrib. collar-membraneous, short, abrupt, truncated ligule, no auricles. seed-very small, slender, tan kernal shape. inflorescence- hairy spike which looks like timothy. collar-membranous, tall, truncated, no auricles. seed-fluffy, large but light, grayish white. Meadow foxtail is often confused with timothy but has fewer leaves, has very early maturation, and the spike can be easily pulled from the peduncle and timothy has more leaves, matures late in the growing season and its inflorescence cannot be easily pulled from the peduncle. inflorescence-spikelike, compact, round cylinder shape, 3-6 inches (7.6-15.2 centimeters) long, dull, awned lemma. culm-harbaceous, hollow internodes, glabrous nodes. leaf-flat, often twisted, bluish color, tapers to tip, upper side slightly ridged, and lower side is dull and smooth. collar-no auricles, overlapping sheath, membranous, long, toothed ligule, notched on either side. seed-very small, rounded, lemma is awnless. culm-herbaceous, unbranched above, joints have glabrous nodes, hollow internodes. leaf-broad, flat, glabrous (hairless), upper side is ribbed, lower side is smooth but dull. collar-membraneous, round to obtuse in shape, very small. seed-very small, fine, narrowly elliptic. inflorescence-spike, whorled, open fingers, coarse. culm-herbaceous, hairs at nodes, hollow internodes. leaf-narrow, linear, conspicuous midrib, sharp tip. collar-no auricles, membranous, tall, abrupt, jagged, hairy (pubescent) ligule. inflorescence-panicle is loose, open, 10-16 inches (25.4-40.6 centimeters) long. leaf-conspicuous midrib, flat, sharp-pointed, pale green on the upper side. collar-tall abrupt, jagged tipped ligule that is wider than sheath, no auricles. seed- large, rounded, many colored. inflorescence-blue to purple in color, sometimes yellow. leaf-three leaflets, middle leaf with longer petiolule, 1/3 of leaflet is serrated. root-large taproot, very deep root system. seed-reddish, yellow or olive green, irregularly reniform (kidney-shaped). leaf-3 leaflets, much like alfalfa but more and not serrated. stipule-two, large that look like a 4th and 5th leaves. root-deep, large taproot with many lateral branches. seed-large, light to dark brown, or purplish, speckled, irregularly oval. The seed pods look like a bird's foot. leaf-glabrous (hairless), 3 round leaflets, with a "V" shaped watermark. seed-extremely small, reddish yellow, smooth. inflorescence-small, white or pink, 3-7 florets. leaf-3 pubescent (hairy), round leaflets and pubescent stems. root-taproot has many fibrous supporting roots, stolons. seed-large black or tan, with a rough look. leaf-3 elongated, pointed leaflets, with pubescence and watermarks. seed-yellow to reddish to purplish, looks like alfalfa seed except it is mitten shaped. crimson clover (Trifolium incarnatum L.) many common names: French clover, German clover, incarnate clover. leaf-3 large, rounded pubescenct leaflets, no watermarks. stipule-wide, veiny, reddish/yellow, ruffled top. seed-large, green, yellow, rounded, a little shiny. inflorescence-dense, one-sided, long peduncled raceme, purplish. leaf-10-20 leaflets pinnately arranged, each tapering to a tip. inflorescence-1-2 flowers near leaf-stem junction. leaf-10-20 leaves that square or flatten at tip with a point coming from the midrib. seed-very large, rounded, velvety, greenish-gray to maroon or black. Common vetch can be distinguished from hairy easily by the inflorescence and by the leaves. Common vetch has a few flowers at stem instead of the long raceme and common vetch leaves have the point at the leaf tip. inflorescence-many white to blue flowers. leaf-finger-like leaflets, mucronate (sharp tip). seed- large, light yellow, sometimes with variegation. leaf-3 leaflets, lower leaves spread, upper leaves erect, round.